Just tryin to get the old smart mixin thing up and running to see what its all about. Icve run into a problem with VAC though. When i try and set up the audio routing in traktor i only have the option of not connected. I'm only using the evaluation version at the mo as it says to do that until i know it works on my system. Can you be a bit more specific ? Maybe some screen shots ? 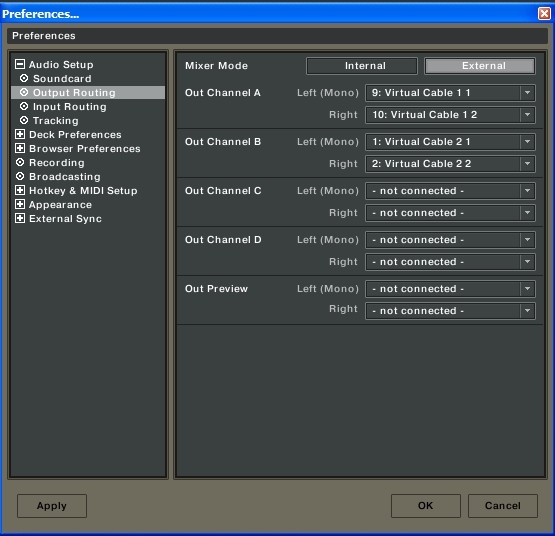 "Now you need to tell Trakor which Virtual Audio cables to use on which deck, adjust with your settings so they look like whats shown below:"
My routings dont show the virtual cable options. Is this as i dont have the full version ... the VAc site doesnt say anything about what the limitations of the evaluation version are but does say to use the evaluation version to check it works as expected. ok so all working now but i cant for the life of me adjust the latency in Traktor. Its sat at 1ms and i suspect this is where my issues with crackles and pops are coming from. Everytime i change it in asio4all i i go back and it hasnt changed. Is this due to me testing with just my internal soundcard, would this have anything to do with it ? nope testing with an internal soundcard wont change anything like that - i find it kinda weird the latency isnt changing, it really shouldnt be doing that. ok not sure whats hapened but the latency is now allowing me to change. Now i just have the issue that the actual latency is so horendus its untrue is this how it has to be ? Ive got it down to about 4ms on ableton and 10.5 on traktor but the actual latency feel is massive. As in , I can pull the jog wheel back about 2-3 inches before the sound even starts to come from the speakers ? How bad was yoru setup ? Your latency should match on Ableton as it does to Traktor - well that what i found when doing it anyway. Mine wasnt nearly that bad at all - i was getting a decent latency response. Cant remember on the top of my head how many ms but i wasnt getting response like i was using WDM drivers. When you say should match, do you mean if i'm showing a latency in traktor of 10ms i should also adjust my settings in ASIO4ALL so that i get the same in Ableton ? What i mean by that is get the match the samples latency - so if Ableton is at 128 samples then match Traktor at 128 samples too.